The Vizsla can be traced back to ancient Hungary in the 10th century. They were bred by the native tribe known as the Magyar who developed the dog with superior hunting abilities suited to the Hungary terrains. Although surviving through many events in history, the breed nearly became extinct by the end of the World Wars. To save the breed, native Hungarians brought dogs to America and Austria in 1950 where they have been slowly regaining popularity. The breed was recognized by the AKC in 1960. 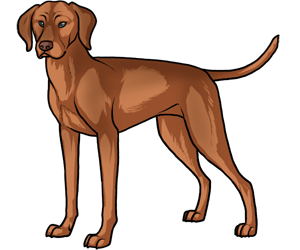 The Vizsla has been used to create many other breeds including the Weimaraner and German Shorthair Pointer. The Vizsla has excellent hunting instinct and is ideal for hunting fowl and upland game. In the Hungarian language, "Vizsla" means alert and responsive. The Vizsla has also been known as the Hungarian Pointer, the Hungarian Vizsla, and Magyar Vizsla.